As my alarm went off that morning, I groaned from exhaustion. Craving so badly to fall back down onto my pillow and hit snooze, realistically I had errands to run and work to do. Luckily though, the relaxation and getaway I needed from reality was not too far away from my grasp. I had an appointment scheduled that day for a solo infrared sauna treatment at Balance Spa, and I couldn’t wait. I’ve been to the spa before to experience their infrared sauna, but this one would be different – they had updated their Sunlighten small near infrared sauna, to a full-size full spectrum infrared sauna. My past experience with the smaller of the two was wonderful. I felt completely zen afterward. So I was hoping the full-size infrared sauna would make me feel equally as relaxed. Upon entering the room they have now devoted to their full-size sauna, I was in awe. They had transformed one of their massage rooms into an entire room dedicated to a peaceful sauna treatment. In it was the full-size sauna, a wooden bench to put your things down and a fountain to pour yourself a cold cup of alkaline water. Although my first infrared sauna experience at Balance Spa was deeply relaxing, I found this one came with much more ease. Ahead of time, I specified my sauna treatment based on my own particular needs. Instead of sitting in a sauna set to one particular temperature for 30 minutes, I got to select a program with its own heat levels based on what I was looking for in a treatment. From my session, I was primarily looking for health benefits. I wasn’t necessarily looking for weight loss but just a program that would help me sweat and clean out any toxins I’ve collected from the environment. So I chose the Detoxification program. Once I got in there, there was limited set up on my part. You simply open the door to the sauna, sit down and enjoy. The lights in the sauna flickered once my time was up. Although I was primarily looking for a detoxifying treatment, I was happy to find how relaxing this experience was. Zen music played in the background and the sauna was visually appealing with its cabin-esque wooden walls. I felt like I was on vacation. The session was not overly hot and uncomfortable. It was just warm enough to get me sweating and to induce relaxation. In fact, I found myself dozing off for the first ten minutes in a state of bliss! But why exactly are infrared saunas so relaxing, and what are the benefits of infrared saunas opposed to a regular sauna treatment? You’ve likely been in a regular steamy sauna room where the temperature is upwards of 200 degrees F. Whether you entered the sauna for relaxation or to induce weight loss, instead you just found yourself panting in discomfort. This is something you will not find in an infrared sauna. The temperature of an infrared sauna is much lower, at anywhere between 115-130 degrees F, while still reaping the many benefits you can get from a standard sauna and in fact being even more powerful. The primary difference between the two is that in a standard sauna, you are heating up the air around you whereas in an infrared sauna you are converting infrared light into heat, which unlike a standard sauna, penetrates the skin. 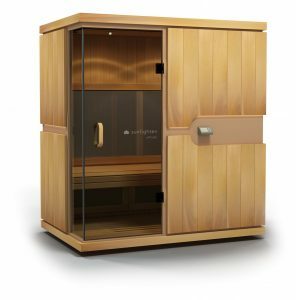 Balance Spa’s previous near infrared sauna hosted a great number of benefits to clients, but now the new addition of a full spectrum sauna uses near, mid and far infrared rays based on the type of benefits the client is looking for. Not only helping us with cooling down after a workout, sweat can also release some of the toxins that our bodies build up from our regular environment. This includes heavy metals we come in contact with from the air, as well as chemicals on the items that we touch. Through an infrared sauna session, your body releases 20% of toxins through your sweat, as opposed to the 3% in a regular sauna session. Naturally, heat increases the blood flow in your body. This in turn loosens your muscles, relieving muscle tension and soreness. In an infrared sauna, you are able to experience deep relaxation at a comfortable heat because the infrared rays penetrate the skin and naturally increase blood flow, relaxing your whole body. In one 30 minute infrared sauna session, you can burn 600 calories! But how? When the infrared sauna is set to a high intensity, it raises your heart rate and heats up your body internally, creating a similar feeling to working out. When subjected to high heat, your body expends a great amount of energy to cool off. This energy is converted as calories, helping you burn fat. The detoxification effects of saunas not only help in the way that you physically feel afterward, but also in your appearance! When you sweat out toxins, you also help with clearing the skin of oil and bacteria that can cause acne and clogged pores. This in turn improves the texture and tone of the skin over the course of repeat sessions. Very similar to the effects infrared saunas have on muscle relaxation of sore muscles, heat also has a strong impact on any non-inflammatory pain. One infrared sauna session can lead to up to 70% of pain relief because it penetrates the tissue at a medium heat, comforting and relaxing the area. At Balance Spa, a variety of programs are available depending on the specific benefits you are looking to get from your infrared sauna session. With this new upgrade from a near infrared sauna to a full spectrum infrared sauna, you can personalize your session to your individual needs. For example, I was looking less for weight loss in my session, but more to simply release toxins. So instead of the sauna staying at a constant medium to high heat, the session started at a high heat and then turned down to a comfortable temperature that I could enjoy and relax with. To book your infrared sauna treatment in Balance Spa’s new full-size full spectrum infrared sauna, call 561-208-8111. Take care of your body today and get sweating!